The vital Hudson River Corridor during the American Revolutionary War. Map of the Country which was the scene of the Northern Army Including the Wilderness through which Gen. Arnold marched to attack Quebec. 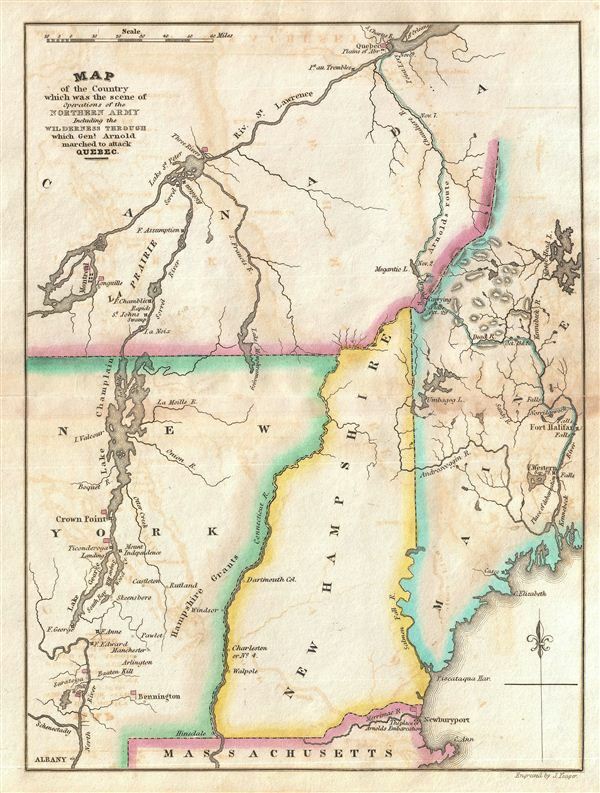 This is a rare map of New York, Vermont, New Hampshire, Maine and Quebec during the American Revolutionary War issued for John Marshall's 1832 edition of the Life of Washington. The map covers the strategically vital Hudson Valley – St. Lawrence corridor between Albany, New York and Quebec City, Canada. From east to west it covers from Montreal and Albany to Maine's' Kennebec River. Various rivers, major roads, and the sites of important battles are noted. Marshall prepared this map to illustrate the important Hudson Valley theater of the American Revolutionary War. Specifically this map documents the Battles of Bennington, Saratoga, Still Water, Ticonderoga, Crown Point, Montreal, Trois-Riveres, and Quebec. Control of the Hudson River Valley and the St. Lawrence Corridor was hotly contested throughout the war. Following several disastrous attempts by the Continental Militia to seize control of Quebec and Montreal the focus of the regional war shifted to the strategically positioned Fort Ticonderoga, which effectively controlled access to the Hudson and Lake Champlain. Fort Ticonderoga changed hands several time during the war but control of the Hudson resolved to the Continental forces following the defeat of British General Burgoyne at the Battle of Saratoga. This victory was one of the great turning points of the American Revolutionary War. Rumsey 2559.006 (1807 edition). Howes, W., U.S.iana (1650-1950): A Selective Bibliography in which are Described 11,620 Uncommon and Siginficant Books Relating to the Continental Portion of the United States, M317.